There are many small woodlands in Britain, those that have existed for centuries, those created by planting and some naturally created through changes to the environment such as change of land use, the decline of mining and market gardening. Whilst all these woodlands have inherent value with regards to amenity, landscape and nature conservation, these values could all be increased with positive sympathetic management involving practices such as thinning, coppicing and ride (path) management. These are all services provided by Adam Phillips who has worked in the conservation field for 14 years after gaining an HND in Countryside Management at Aberystwyth, Wales, and a qualification in Arboriculture (tree surgery). Since moving to Cornwall in 1995 he has worked for Wildlife Woodlands, near Callington, and then the British Trust for Conservation Volunteers Contracts who took over Wildlife Woodlands. Adam decided to start his own business in 2001, with the aim of providing small scale personal advice and services within the small woodland and conservation sector. “I have had a variety of work gaining contracts with both larger organisations and residential clients and I have opportunities for expansion, however the niche I fill at the moment is one of personal service, which I enjoy,” Adam says. He has been working with woodland managers and landowners (mainly estates and farms) and his aim is to help landowners bring small woodlands and hedgerows in the area into productive and sustainable use for wood fuel. This can be an asset for the landowner and contribute to nature conservation. To satisfy this niche, it is critical that Adam has the right equipment to enable him to access and manage woodland and hedgerows. A grant from LEADER through the South and East local action group enabled Adam to purchase equipment that he needed to be able to manage areas he could not access without specialist equipment and also to provide additional services. 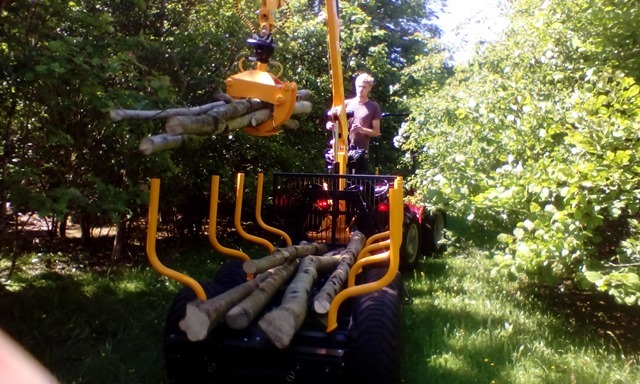 The new equipment consisted of a compact alpine tractor to provide low impact accessibility to narrow areas, a forwarding trailer and crane, a log grapple to move individual large pieces of timber and a side arm flail/finger bar mower to allow access for woodland management. 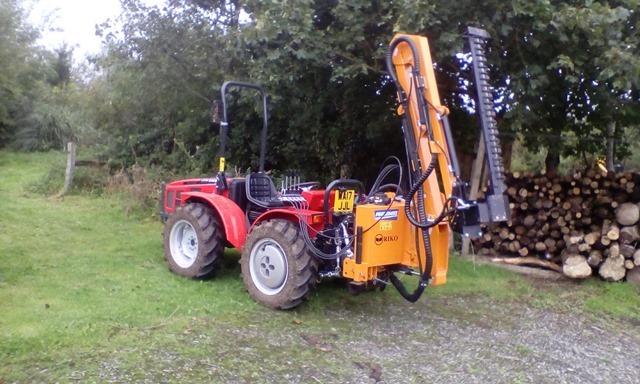 This allows the cutting of rides, paths and hedgerows with restricted access. With his wide variety of skills Adam can advise on all aspects of tree planting undertaken for timber, amenity or conservation purposes, vegetation management and advise on natural regeneration of woodland. enhanced interest and diversity. The equipment provided with help from LEADER funding has already been used as it is the most suitable tool for certain work, such as with tight access or on steep slopes. The equipment has been in place for 6 months and Adam hopes that in the future he will be able to take on an apprentice to share his skills and to assist him in his business. Adam lives and breathes countryside conservation, when he is not working he enjoys managing his own land surrounding the picturesque miner’s cottage where he lives with his partner. They have 5 acres of land and Adam is planting trees and shrubs and managing the meadows to promote wildlife and wild flowers as well as growing fruit and vegetables. Without the new equipment Adam had to turn down some contracts, now he can offer his services to a wider range of clients and this will help him expand his business in the future and potentially offer employment to others; a great example of how LEADER funding is helping small sole traders diversify their operations.